Early in February at around 4:45 p.m. my husband and I saw what we are quite sure was a Grey Fox right behind our house here in Peterborough. It was grey in body colour with a black tail. 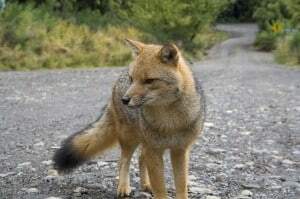 It had a thicker body than a Red Fox, was sturdier looking and with shorter legs.The Gray Fox looks much different from the Red Fox. We have had a chance to observe a Red Fox family at our farm. They lived under our shed. The female had 6 kits and she and the male took turns hunting and looking after the kits. We watched them the whole summer until they were old enough to leave on their own.I have never seen a Grey Fox before and was surprised to learn that they can climb trees. I live on the new part of Carriage Lane which backs onto a bit of bush edging a farmer’s field.